1. The Big Lake. Lake Michigan for you non-Michganders. We spent so many summer days at the Grand Haven State Park, and at our friend’s condo in Holland. The water is warm, unlike any water in Montana. I used to say that I wouldn’t get into Lake Michigan until it was a least 70 degrees. If I waited that long in Montana, I would never swim. 55 degrees maybe? At best? The waves are big. The sunsets are spectacular. I didn’t realize how lucky I was to have such immediate access to such an amazing body of water. I don’t miss: when the alewives die off, and green, mucky seaweed in my bathing suit after a really wavy day. 2. In conjunction with #1, sand beaches. You should have seen my boys when they saw a sandy beach for the first time. We were at Sleeping Bear Dunes. The youngest kept stopping to dig holes in the paths. In Montana, you generally have to wear water shoes whenever you go into the water–rocks of various sorts, from gravel to boulders, decorate the shores. In Michigan, my feet were so nice and soft in the summers! 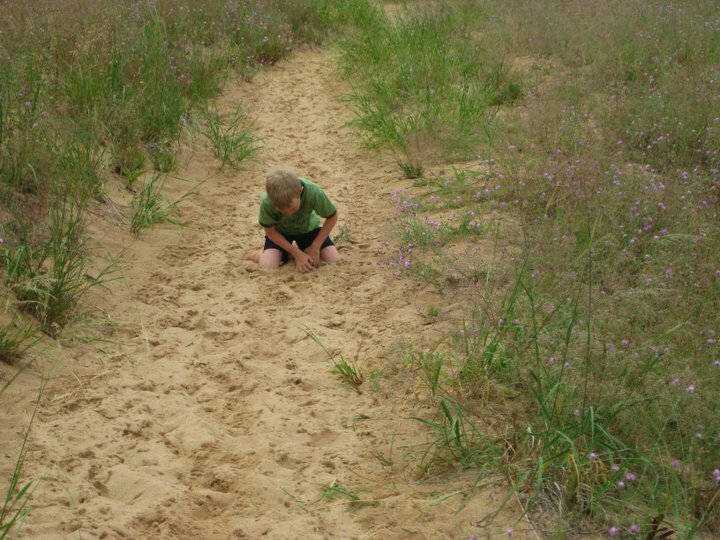 I don’t miss: sand in every crevice after playing the the beach or in the lake…especially that stray grain that gets in your teeth. Yikes. 3. Warm nights. I am one of those odd ducks who likes humidity. I don’t always like what it does to my hair, but I love going outside at 10 pm in shorts and a t-shirt, or going for a late night swim…in NW Montana, you bring a sweatshirt wherever you go. The dry air makes the temperature drop quickly after dark. Summer nights are usually in the 40s. Brrr. I don’t miss: the mosquitos. In Montana, the mosquitos seem to go to bed at night. Not so in the Michigan of my memories. 4. Thunderstorms. Big, booming, thunderstorms with non-stop lightning. Nothing I’ve seen here even comes close. A few claps of the thunder…and it peters out. So sad. When I travel, all I ever really want to see is a really awesome thunderstorm. The storms must know I’m in town, because they stay away. Oh…and warm rain. If it rains in Montana, it is cold! I don’t miss: actually, nothing. I love thunderstorms. 5. Ann Arbor. Missoula is an Ann Arbor in the making, but it just doesn’t have the same vibrancy or size. Missoula is cool town, for sure…but you can’t beat the old university buildings, funky restaurants, art fair, Big House, etc. 6. Places from my youth: Camp Henry, Manistee, Beaver Island, Traverse City, Ludington, Birmingham, Mackinac Island. Grand Haven, Spring Lake, Holland. Cascade, Ada, Forest Hills. Pine Ridge Elementary. Fallasburg Park (Reggae!). 4 mile. Freddie’s house. I don’t miss: Traffic. Expressways. East Lansing. The Beltline and 28th Street. 7. Fall colors. Everything in Montana either turns yellow or remains green. It is definitely pretty…but nothing beats the colors of a Midwestern autumn. 8. My cousins and extended family and close friends from high school. They are so far away. Or I am, I guess. My next Michigan/Montana post will be about why I love Montana so much. Stay tuned! Michiganders, what do you love most about the Mitten? Non-Michiganders, what do you miss about your respective home states? This entry was posted in Michigan, Montana and tagged Lake Michigan, Michigan, Montana, sand beaches, thunderstorms. Bookmark the permalink. ← Where is My Snow? now with having kid(s), the idea of traveling and seeing more places sounds daunting…. but visiting montana / you / your family, i high on the list. Roo did great on the trip to Florida so i have high hopes!! We will have guest quarters! wait….we’re last? Oh, oops! You’re talking about the ones still in Michigan!